Find out where you can attend a teaching or meditation retreat with Lama Mark. Access a regularly updated archive of recorded audio teachings from Lama Mark. Find out more about Lama Mark and the lineages of teachings. Lama Mark Webber (Lama Karma Tenpa Lekshe Yongdu) has been studying and teaching Buddha Dharma through the traditions of Buddhism for thirty-eight years. His universalist approach is classically founded in Buddhism and a number of meditative traditions, while completely integrated with contemporary life and the richness of modern Western culture. Through many vehicles—including Buddha Dharma and meditation, art and craft work, science and natural history, plus world travel—Lama Mark displays the wondrous unity, uniqueness and intrinsic freedom of all life. Lama Mark’s emphasis with practitioners and students is on uncovering pure Dharma to reveal its extraordinary benefits and share the great joy of its deep study, meditative practices and integration into all aspects of our lives. 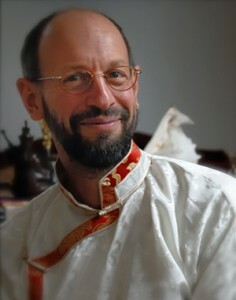 Lama Mark resides on Galliano Island, near Vancouver, BC, Canada but teaches around the world for much of the year. More information can be seen here.